Was hanging out at my favorite slick deal site and noticed the Tangerine KitchenAid mixers were on clearance at various Targets across the country. Lo and behold our store had one for 70% off, and I had a $5 coupon and 5% cash back...$85 out the door! 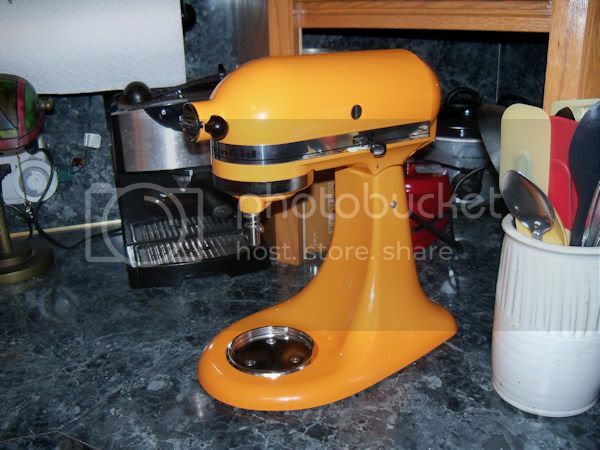 Upgrading to the orange (my kitchen is terra cotta color so it works) and giving my old white classic one to my mil for Christmas. WOW! Way to go. Great color, too. Great buy. My hubby had his harley pin striped. I told him I wanted my KitchenAid pin striped. Fun color and great buy! Bet you'll be whippin up some holiday goodies with that. What a terrific bargain!! So glad it was the colour you wanted too. Have fun with it. We all love a bargain and you've certainly got one there and with colour to match too a real result.